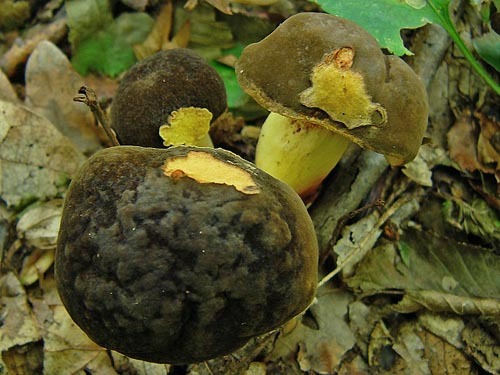 Cap up to 10 cm, at first hemispherical, later convex to flattened, ochraceous, light to dark brown, greyish brown, or olivaceous brown, sometimes reddish brown, reddish or almost black, dry, velvety or finely dusted, very rarely cracking and yellowish or whitish flesh is seen in the cracks. 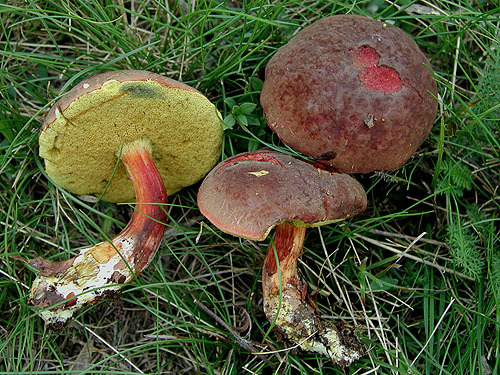 Stipe cylindrical to almost club-shaped, sometimes hardly swollen in the lower part, pale yellow or yellow, downwards gradually becoming reddish, covered with scattered fine red granules, blueing when bruised. 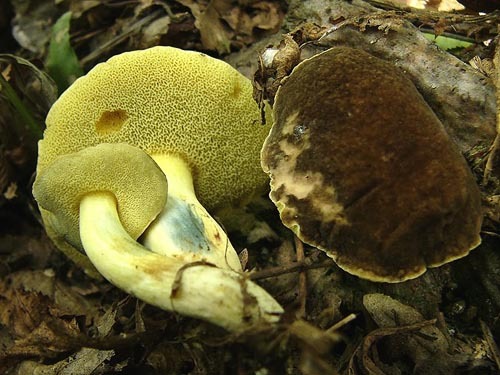 Tubes pale yellow to yellow, blueing or not when injured. 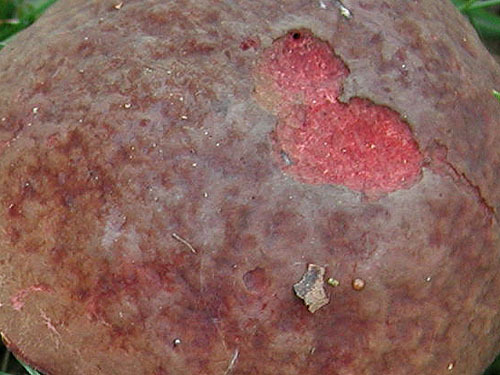 Pores concolorous with the tubes, blueing or not when bruised. 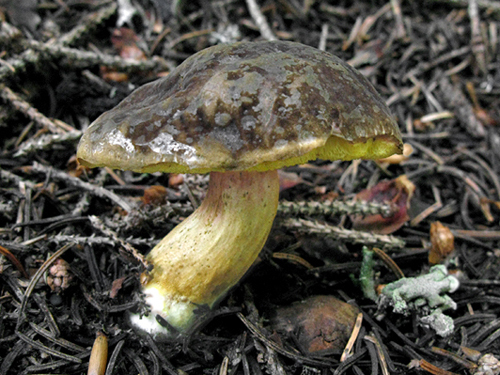 Flesh yellowish in the cap, yellow in the stipe, blueing strongly (and usually slowly) when exposed to air. Smell not distinctive. Taste not distinctive. 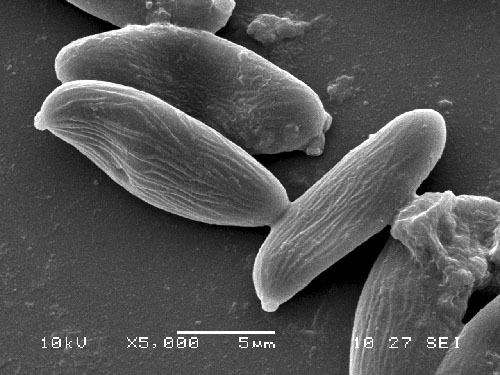 Spores 11–15 × 4.5–6 μm, striate. Pileipellis palisadoderm of septate hyphae of cylindrical, incrusted cells. Habitat. Mainly in broadleaf or mixed forests, or in parkland, mycorrhizal mostly with beech (Fagus) or rarely with oaks (Quercus). Distribution. 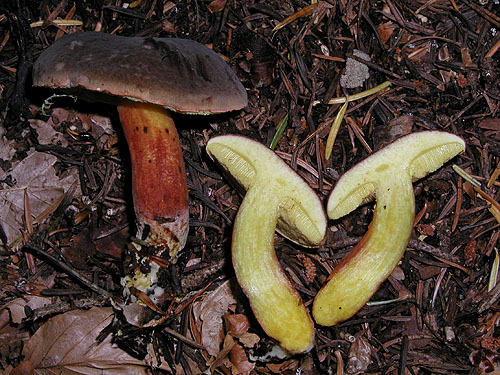 In Europe widespread, but the true distribution is somewhat obscured and is yet to be justified as it might have been confused in the past with the other members around Xerocomus chrysenteron. 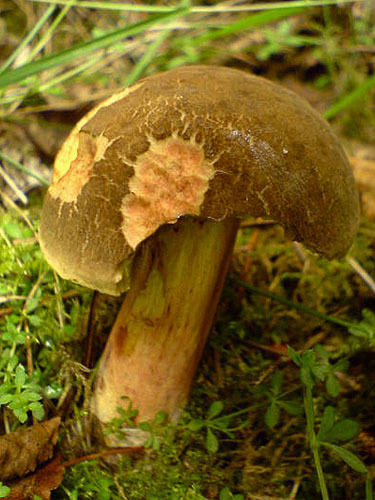 Xerocomus chrysenteron, has cracking cap cuticle with pinkish flesh seen in the cracks and smooth spores. Hills, A.E. 2008. 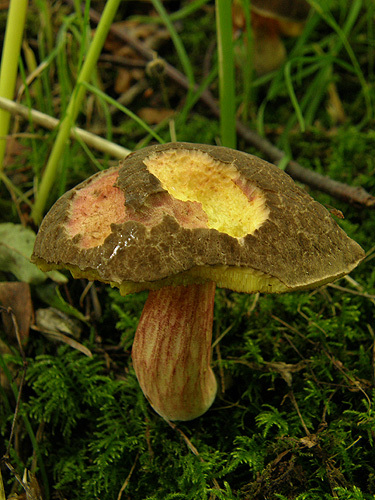 The genus Xerocomus. A personal view, with a key to the British species. – Field Mycology 9(3): 77–96. Ladurner H. 2001. La variabilità microscopica di Xerocomus pruinatus e la sua delimitazione da specie simili. – Micologia e Vegetazione Mediterranea 16: 46–54.